Winterizing a radiant heat system keeps it from freezing when not in use or when exposed to temperatures that may cause freezing of regular water. A radiant heat system can be winterized with a special type of antifreeze. Some systems can run full time with an antifreeze solution in them. Replacing the water in the system with antifreeze can be accomplished with a few steps and some basic knowledge of how the system works. Calculate the amount of antifreeze you need to winterize the system. Calculate the size of your system by adding in the volume of the tubing to the water in your heating source. The tubing volume can be calculated based on its diameter and material. Tables for performing the calculations are available online. Consult the system manual or antifreeze container to determine if it needs to be a full antifreeze solution or diluted with water. Consider this in your calculation. Turn off the main water supply to the system. 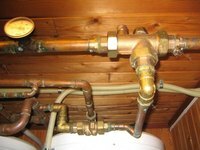 This should be done on the line before the water heater, where the main water source comes into the home. Locate the intake line from your heater and follow it to a lever valve. This is the "on" and "off" valve; turn it to the "off" position. This keeps water from flowing into the system while you are adding the antifreeze. Pour the antifreeze into the clean dry barrel. Attach one of the garden hoses to the sump pump, then attach the washing machine hose to the connector on that hose. The washing machine hose is the same as a garden hose except it has two female ends. Locate the fill valve on the mechanical section of your system controls and connect the washing machine hose by screwing it to the valve. It will have a hose acceptor much like an outdoor faucet. Insert the sump pump into the barrel and be sure it is submerged in the antifreeze and anchored so no air gets injected into the system. Plug the sump pump into a power source. Open all the valves on the front of the pumps and on the tubing circuits so the entire system is open and flowing. The valves are opened by turning the handles from "off" to the "on" position. Each circuit and pump has an "open" and "close" valve. Attach the other garden hose to the drain valve. Run the hose outside or to a drain where the water from the system can flow. Locate the ball valve between the drain and fill valves on your mechanical section and turn it to "closed" to prevent fluid from flowing openly between them. Turn the fill valve to "open" and turn on the sump pump. Then turn the drain valve to "open." The sump pump will begin pumping antifreeze into the system as the water in the system is then ejected from the drain valve. As the barrel drains add more antifreeze until the total amount needed has been pumped into the system. Close the drain valve when the antifreeze nears the bottom of the barrel. Turn off the fill valve and sump pump. Reopen the ball shutoff valve between the fill and drain valves. Turn on the main water supply for the system. Let the system re-pressurize to its normal operating pressure. The normal operating pressure is preset on the dial valve on the mechanical section and should also be noted in your users' manual. If you don't have a basic understanding of the system you may prefer to have a qualified HVAC contractor winterize it for you. A radiant heating system that uses the hot water heater used for drinking and personal use for your home cannot be winterized with antifreeze. The antifreeze for ta radiant heat system is not the same as automotive antifreeze.